Gary Conway (born February 4, 1936) is an American actor and screenwriter. His notable credits include a co-starring role with Gene Barry in the detective series, Burke's Law, from 1963–1965. 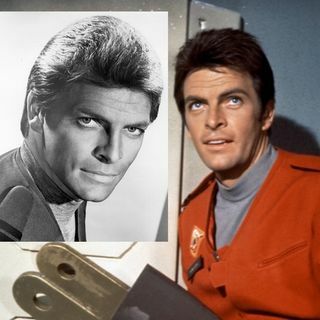 In addition, he starred in the Irwin Allen sci-fi series Land of the Giants from 1968–1970.Conway was born Gareth Monello Carmody in Boston, Massachusetts. Conway has been married for many years to Marian McKnight, who was Miss America, 1957. They first met while students at the University of ... See More California, Los Angeles, where Conway studied art. The couple have two children. They have worked together in film production and writing and own a winery called Carmody McKnight. Conway and his wife manage a winery they started a few years ago. They have two children, Gareth and Kathleen. Conway and his Burke's Law co-star Gene Barry remained close friends until Barry's death in late 2009.Conway's early film credits include the cult horror films I Was a Teenage Frankenstein (1957) as the monster, and How to Make a Monster (1958), In 1958, he was cast with Richard Beymer in the episode "Man Hunt" of the western aviation television series, Sky King, with Kirby Grant and Gloria Winters. In 1960, Conway appeared as Lt. Charles Williams in the episode "Absent Without Leave" of the ABC/Warner Brothers western series, Colt .45, starring Wayde Preston. Tyler McVey was in the guest cast as Col. Ben Williams, and Steve Brodie also appeared in the episode. He also appeared in 1960 in three episodes under the names of different characters on the ABC/WB crime drama, Bourbon Street Beat, starring Andrew Duggan. In 1966 Conway made an unsuccessful television pilot Assault! a spinoff from Combat! about the US Marine Corps in the Pacific. Conway starred with Bette Davis in the 1972 television movie The Judge and Jake Wyler. In 1973, Conway was featured in Playgirl magazine's August issue. He also guest starred as the murder victim in the 1973 Columbo episode "Any Old Port in a Storm." His other film credits include Young Guns of Texas (1962), Black Gunn (1972), The Farmer (1977), Once Is Not Enough (1975), American Ninja 2: The Confrontation (1987) and Liberty & Bash (1989). He also starred in Woman's Story (2000), which he also wrote and directed.